Looking for live chat software to integrate into BigCommerce? Zoho SalesIQ is developed to build your e-commerce business. It will empower you to track visitors on your site, provides an insight on the products they are viewing. 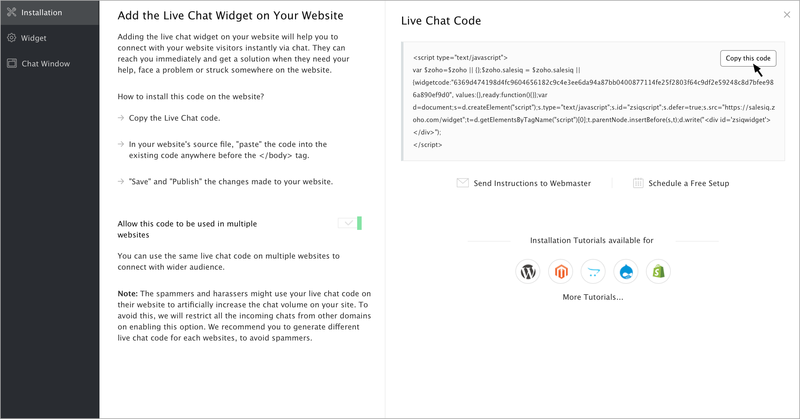 You can also customize the look and feel of the live chat widget to match your site design. How to install the Zoho SalesIQ extension in Bigcommerce? Login to your store's control panel. Click on "Advanced Settings" and select "Live Chat". Choose the option "Other Third Party Live Chat Service", and then click the "Save" button below. Click on the second tab "Other Third Party Live Chat Service". Here you will need to paste the Zoho SalesIQ code snippet into the Live Chat Code box. Then make sure to choose "At the top of the page". Then click the "Save" button below.